Secretary-General Addresses 2015 World Economic Forum. United Nations Secretary-General Ban Ki-moon today urged world leaders gathered at the World Economic Forum in Davos, Switzerland, to maintain their focus on a broad range of climate, development and gender equality issues, warning that as the global community continues to face multiple crises, the new year must be a time for ‘strong commitment’ from international stakeholders. Mr. Ban is currently in Davos to push the United Nations agenda for 2015 which is set to be a critical year for the Organization and its member States as they confront the imminent deadline for achievement of the landmark Millennium Development Goal (MDG), and work to achieve a meaningful global agreement at the end-of-year Paris climate conference. In a separate MDG meeting with advocates also held today, the Secretary-General underscored the importance of delineating a credible sustainable development goal strategy to pick up where the MDG’s leave off, adding that Member States would need to devise “very robust, visionary, and ambitious targets” in order to finalize the Millennium targets stated hope of ending poverty. “The most important priority is that these goals should be people-centred, planet sensitive and climate friendly,” he continued. “People should be at the centre of our vision. That’s what I'm asking you to continue to do,” he told delegates. Against that backdrop, Mr. Ban also also emphasized that future gains would depend on making advances in achieving gender parity as he drew particular attention to the ongoing UN Women-led HeForShe campaign. “The Millennium Development Goals recognized that gender equality and women’s empowerment are essential to tackling poverty, hunger and other global problems,” he explained. As the Secretary-General continued his programme throughout the day, business, entertainment and civil society leaders announced new commitments at the Forum to promote the successful adoption of a new UN sustainable development agenda this September and climate agreement in December. The Davos announcements followed the launch of major mobilization by civil society, “Action2015.”Many of the new commitments were announced at an “Action in 2015" dinner hosted by Microsoft co-founder Bill Gates to launch global mobilization effort for the post-2015 sustainable development goals. Countries are presently negotiating a set of new goals that build on the successes of the MDGs in reducing poverty and improving people’s lives. In Davos, plans were also launched for a series of Live Earth concerts to promote support for a climate agreement and a ‘celebrative concert’ in partnership with the UN at the launching of the goals. Bono's ONE Campaign committed to promote the new goals, and the need to accelerate action on the MDGs, while Chris Martin of the band ColdPlay, and Will I Am of Black Eye Peas committed to help end poverty through music. Other commitments to promote the new goals came from the Caterpillar Foundation and corporations, such as Unilever. 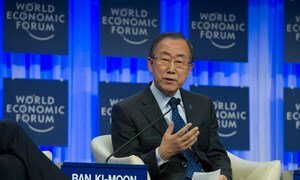 Secretary-General Ban Ki-moon kept up the drumbeat for business to play its full part in tackling climate change and promoting sustainable development for a second day today, telling the World Economic Forum in Davos that investments now will generate major savings for tomorrow.